Once there was a joy which filled heaven and earth and woke me in the night and refreshed me by day. But never knowing the source of this joy, I could not give it a name, nor did I understand that it was joy. It was so complete that it covered the mountains and the sea and the green meadows. The trains which passed and the trams on the hill were too good to be true. Then there came spikes in the dark. Thomas Alfred Good was born in 1901 into an “almost mid-Victorian” household in Beeston, Nottinghamshire. His father Francis Henry Good, an ex-actor, latterly confined to a position in the family firm of grain importers, lost heavily in financial speculations and died abruptly, reducing his family to “genteel poverty”. Good’s childhood was mostly spent “energetically and idyllically,” but with frequent periods of “anaemia and nervous exhaustion.” His time at All Saints’ School at Bloxham, a Woodard and Oxford Movement institution, moulded his Christian faith into a high Anglican stance, leading him to Pembroke College, Oxford and then to theological college to train for the ministry. An “unconsummated love-affair” then pushed him, “with the aid of an illusory suspicion of impotence,” into an unfortunate vow of celibacy; with “the healthy flow of the rising instincts all diminished,” he adopted a heavily ascetic and contemplative lifestyle. Enforced delay, sharp torture of restraint. Retiring immediately from the church, Good married Mary, his bible class pupil. The couple settled in leafy Godalming in Surrey, Good to a life of writing, supporting himself by reviews and lit crit. 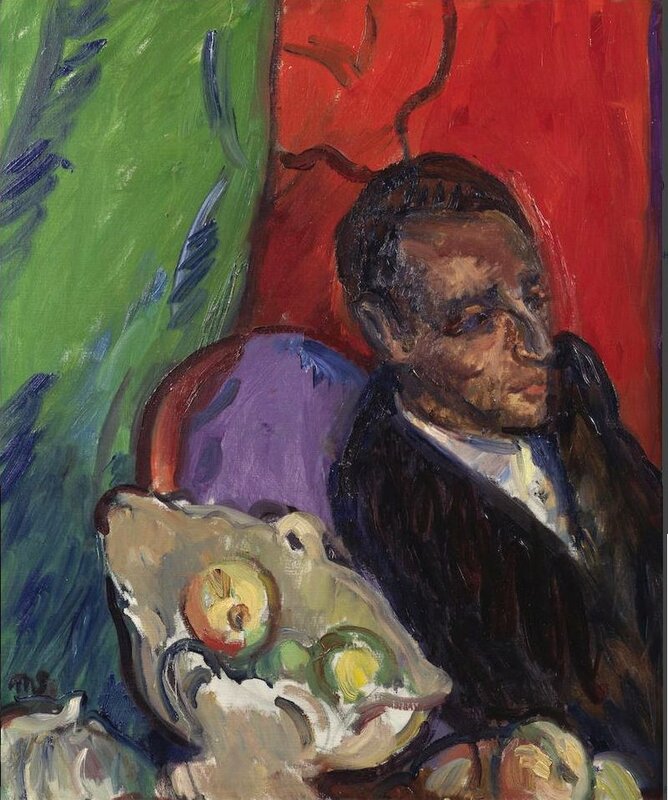 Finding his attempts at novels “weary,” he decided to embrace poetry; though “only just emerging from a long spell of Swinburne and the pre-Raphaelites,” he moved on swiftly to Pound and Dylan Thomas, and then to the French symbolists and modernists, particularly Apollinaire, Paul Eluard, Max Jacob and Pierre Reverdy. A relapse into anxiety in 1937 prompted a move, with wife and young son, to convalescence in Aix-en-Provence. Here he read profusely in French and developed his writing, contributing to Les Cahiers du Sud and transition, and befriending the poet Joë Bousquet (“the invalid Cathare of Carcassonne”). War and invasion brought the Good family back to England, Pimlico, the Blitz and the sympathetic acquaintance of Michael Hamburger, Dylan Thomas and David Gascoyne. These and other Fitzrovian contacts of the early ‘forties brought him closest to an established reputation, and his poems, translations and articles on Jacob, Reverdy, Apollinaire and Aragon appeared in Poetry Quarterly, Poetry London, New Road and Transformation, all broadly neo-romantic in stance. Muffle the cadenza of grief from the script of memory. Despite the encouragement and recognition, Good found Soho boho less than congenial, and in poems such as “Ballad of the Coffee An’” (“a notorious London night haunt frequented by spivs, other undesirables, and aspirants to the arts”) he recoiled at “the tortuous faces / Gathered in a basement den”; “the lecher and the looter / Haunted by the world’s indifference”; “The Jazz fiends crooning to each other, / Nonchalant lackeys of the future” and “poets with furred tongues / Who flew in droves and pecked each other’s parings.” Yet in this poem he is happy enough to find himself in the Coffee An’ in pursuit of “a girl familiar, unexpected,” who “suddenly bequeathed a smile,” only to be warned the next night: “She’s not here tonight, so beat it, / There’s a Black Maria outside.” But Good does not count himself, you understand, among the lechers and looters. And apparently marriage did not preclude occasional sexual adventures. 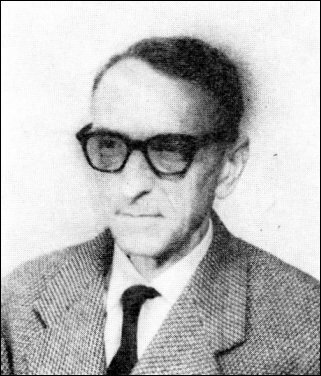 In 1946 Good returned alone to Aix, developing the collection of poems that would be published later as Out of Circumstance, giving private lessons and working as an assistant teacher. 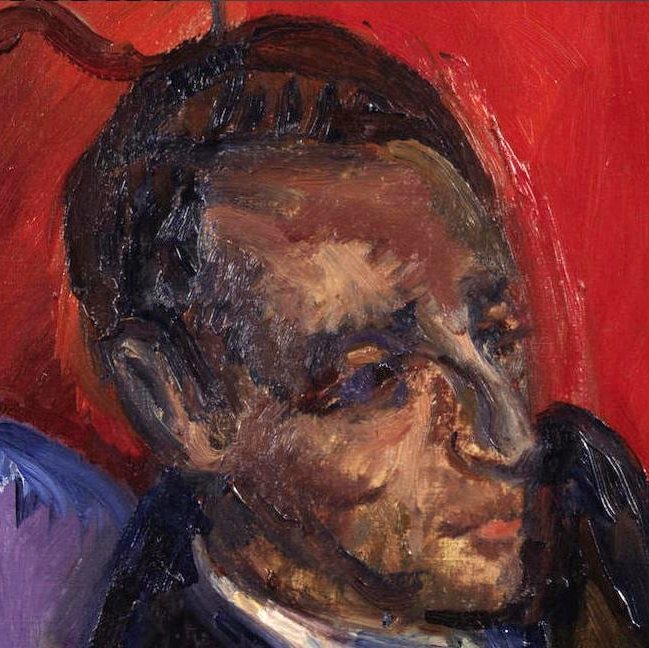 In 1950 he came back to London, where he found himself regarded as an “old” poet, but also spent some time in Lebanon. 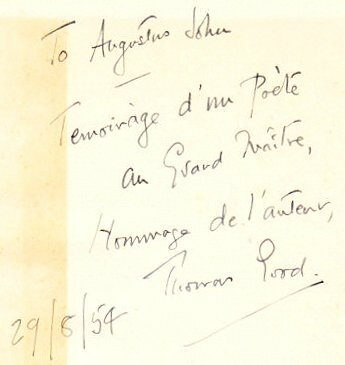 He had made the acquaintance of the painter Augustus John, probably in Provence just before or after the war, as indicated by the slightly fawning inscription in my copy of Out of Circumstance; now he became friendly with the painter Matthew Smith – a fellow Francophile – who made three portraits of him. 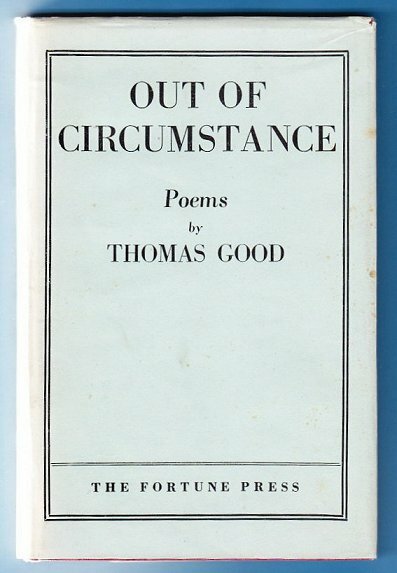 In 1954, at the close of this “arid” period, Out of Circumstance, rejected by T S Eliot at Faber’s, was published by that old faithful, The Fortune Press. On the blue vase of the world. As the stars swoop, the comets brood. In 1955 Good left the country with £10 in his pocket, to work at the British Institute in Florence, and later at the Cambridge School in Verona. In 1956 his son John died suddenly at a tragically early age, and in 1957 Thomas and Mary Good were legally separated. 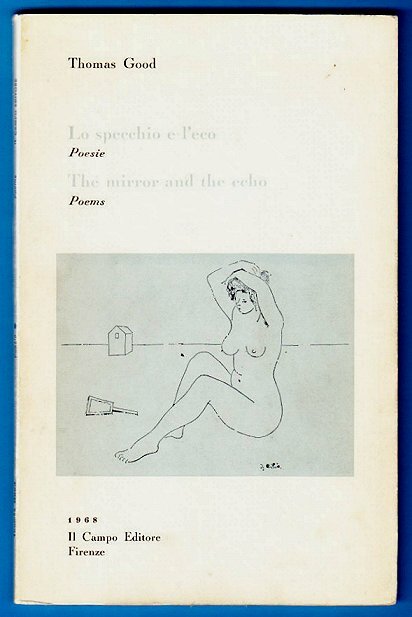 Not surprisingly, “nervous prostration” still hindered his creative work, though in 1963 this was succeeded by a three year “phase of spiritual illumination” that produced in 1968 the bilingual collection The Mirror and the Echo, published by Il Campo Editore in Florence. The book is punctuated by a few line drawings by G Cilio, an artist I haven’t been able to trace elsewhere. The work of these later years is simpler, quieter, less expansive, more syntactically coherent. At its best it achieves a metaphysical serenity, a tranquillity that lifts it above the banal. Even an occasional prose poem, on the model of Max Jacob, makes an appearance. By 1969 Good was back in England, staying at the Hotel Stuart in Richmond, Surrey, but unable to face the demoralising prospect of life in an old people’s home he drowned himself in the Thames in January 1970. His body was not found for several weeks. Among his few but well ordered effects was the typescript of a collection of last poems, titled “The Diamond Path.” From these, Michael Hamburger later selected eighteen for inclusion in the 1973 Selected Poems. In addition to essays and reviews, Good completed some prose fiction and verse drama. A novel titled “The Seated Woman” was rejected by Wrey Gardiner’s Grey Walls Press in 1946. (This may have been the “novel about life as a priest” that Good mentions as written before the war.) By 1950 he had completed a prose piece, “Death is a Red Berry,” which as late as 1969 was submitted to Penguin Books, without success. In 1954 a dramatic poem “Supper in the Garden” was rejected for broadcast by BBC Drama. During the same period his second unpublished novel, “Rhapsody in a Minor Key,” was refused by at least fifteen publishers, including by Eliot at Faber. None of these works have appeared in print. Images of Thomas Good – the Smith portrait in middle age, the more elderly cover photo to The Mirror and the Echo – show a high, finely boned, sensitive face, unsmiling, in which we might read the physiognomy of self-denial, if not that of self-indulgence. 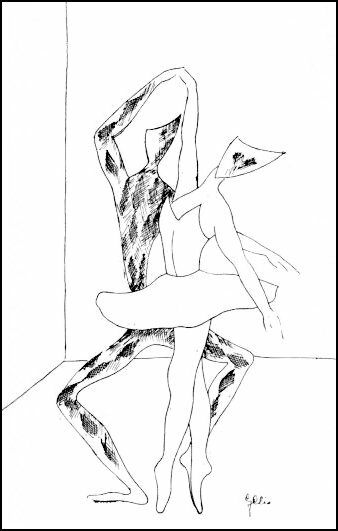 These polarities, sense and spirit, are the horns of Good’s “existential dilemma,” his struggle to find a secure centre. They inform, to some degree and at some level, virtually every poem. Though it’s bracketed with “savage”, I am not sure what he may here have considered “modern”. Strongly influenced by the preceding generation of French fellow travellers of surrealism, Good was no antiquarian, nor did he exalt any preoccupation with “tradition” or form. In fact Michael Hamburger notes a “peculiar stylistic uncertainty,” an “unevenness of diction and intensity” running through much of his work, finding it symptomatic of Good’s greater “existential dilemma”. Hamburger justifiably regrets this as a flaw, but at least this uncertainty can keep the work on its toes. Even when the initial impulse is romantic introspection or bewilderment, or the cataloguing of sense impressions, Good splices his experiences and appearances with the arbitrary, wrenching and knocking them into an abstracted, transvalued vision that, while its grounding is never in doubt, now exists within poetic time and space, as language that will last. 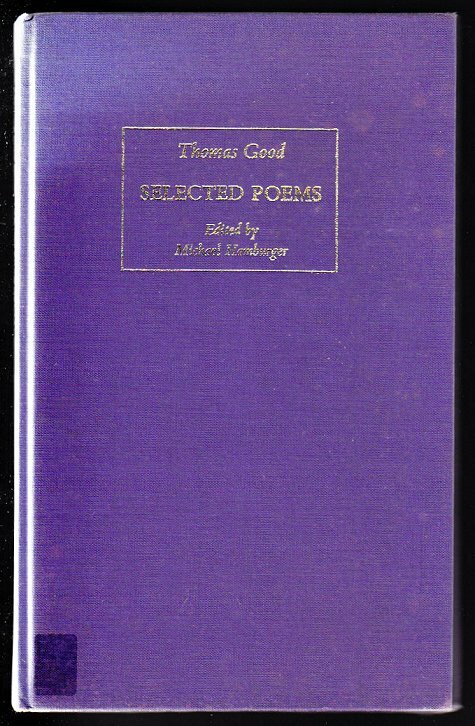 For a selection of poems by Thomas Good go here.